Furniture, sterling silver, Christmas items, Singer Featherweight, misc items and more. Payment Instructions: We'll take payment for this auction at the home in Upper Arlington when you come. You can pay by CASH or by CREDIT CARD. There is an additional 3 percent fee on credit cards, but feel free to bring cash. We're not taking checks for this sale. So no checks. WE HAVE BROUGHT SHIPPING IN HOUSE. We have had perennial problems with outside shippers, worst of which is shoddy packing and damaged items. This is unacceptable. So we will pack and ship your items in house. We are excellent packers and will try our best to be reasonable cost wise. IF THE DESCRIPTION SAYS SHIPPING NOT AVAILABLE WE WON'T PACK AND SHIP. By bidding this this auction you as the winning bidder agree to authorize your registered credit card to be charged by Burns Auction & Appraisal LLC for the invoice total if you, the winning bidder, do not pick up and pay during the designated pickup times/hours, then you, the winner bidder, also authorize us to ship your item, and bill your card for shipping. The home is in Upper Arlington, and we will send you the address once the auction is done. All sales are final and no returns are given. WE DO OUR BEST TO DESCRIBE ITEMS COMPLETELY. DO NOT BID IF YOU ARE NOT SURE, REFUNDS ARE NOT GIVEN. Shipping Instructions: By bidding and not picking up, bidder gives Burns Auction & Appraisal permission to transfer won lots to our warehouse for shipping. WE HAVE BROUGHT SHIPPING IN HOUSE. We have had perennial problems with outside shippers, worst of which is shoddy packing and damaged items. This is unacceptable. So we will pack and ship your items in house. We are excellent packers and will try our best to be reasonable cost wise. IF THE DESCRIPTION SAYS SHIPPING NOT AVAILABLE WE WON'T PACK AND SHIP. Preview Date & Times: No preview will be available for this auction. Checkout Date & Times: Open pickup hours will be available on Tuesday, April 16 from 6pm to 7:30 pm. We will ship your items in house and charge your card. IF THE DESCRIPTION SAYS SHIPPING NOT AVAILABLE WE WON'T PACK AND SHIP. Open pickup hours will be available on Tuesday, April 16 from 6 pm to 7:30 pm at the house. You must pick up on pick up day and during these times or you will forfeit your items. If shipping is not available your items will be disposed of at our discretion, meaning we will either throw them in the dumpster or take ownership of them after billing your card. Please leave yourself enough time to get all your items before the cutoff time. By bidding in this auction the buyer agrees to follow safe and proper moving, loading and securing procedures when handling all lots purchased in this auction, and when handling any other items at the pickup site. By bidding the buyer also agrees that he/she and any helpers have the experience, training and proper equipment needed to safely move and load the items purchased in this auction, or, if not, that he/she will employ movers that do. The bidder further holds Burns Auction & Appraisal LLC harmless for death, injury or damage to property incurred during the auction pickup. Buyers agree that any items left behind within the home after the pickup hours will be treated as abandoned and disposed of at the discretion of Burns Auction unless other arrangements are made in writing with Burns Auction during the pickup hours and that refunds will not be given. Bidders agree that they are solely responsible for confirming that all of their purchases have been removed and loaded prior to departing the sale site for the day. Bidders also agree that items left behind after pickup hours because of confusion, a mix up, oversight or any other reason will be considered abandoned and disposed of by Burns Auction without any refund to the buyer. Please check over your invoice one last time before leaving to ensure you have everything. We often clean homes immediately following a sale's pickup hours and will dispose of what is left behind at our discretion. By bidding and not picking up, bidder gives Burns Auction & Appraisal permission to transfer won lots to our warehouse for shipping. WE HAVE BROUGHT SHIPPING IN HOUSE. We have had perennial problems with outside shippers, worst of which is shoddy packing and damaged items. This is unacceptable. So we will pack and ship your items in house. We are excellent packers and will try our best to be reasonable cost wise. IF THE DESCRIPTION SAYS SHIPPING NOT AVAILABLE WE WON'T PACK AND SHIP. CONTENTS of furniture lots is NEVER included in the lot unless explicitly stated. Bring packing materials and boxes. Bring loading help. We can't help at this sale as we'll have a small staff. WE DO OUR BEST TO DESCRIBE ITEMS COMPLETELY. DO NOT BID IF YOU ARE NOT SURE, REFUNDS ARE NOT GIVEN. Free pickup up we'll drop at the shipping warehouse for $3. You've been outbid to m****k! to YOU! You've been outbid to D****9! to YOU! Rare. Very nice. Free pickup up we'll drop at the shipping warehouse for $3. Pitcher has a chip. Pickup only. Nice condition. Free pickup up we'll drop at the shipping warehouse for $3. Both appear nice. Free pickup up we'll drop at the shipping warehouse for $3. You've been outbid to p****8! to YOU! 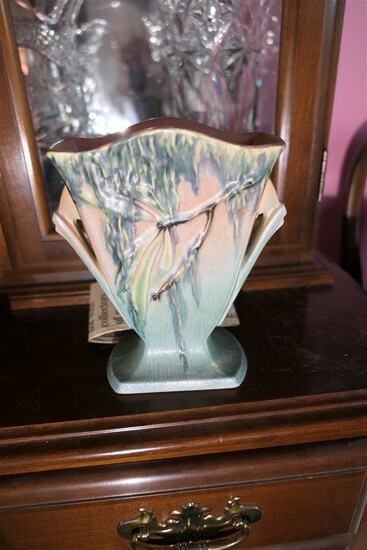 Nice Antique Roseville Pottery Fan Vase 778-7"
Nice piece. Free pickup up we'll drop at the shipping warehouse for $3. You've been outbid to 6****k! to YOU! Looks like a small carved burl, carved wood, a bone and silver sword handle styled end and an end that has a silver collar but that has broken off. Plus an old riding crop. Neat lot. I have not opened these but I'd assume the fabric could have issues. Free pickup up we'll drop at the shipping warehouse for $3.